Bonaverde is something so new that it's a bit of a head scratcher. You can already get bean-to-cup coffee makers. In the outer reaches of artisan coffee culture there are a few people roasting their own beans. And ethically sourced coffee remains a concern for many. Well, Bonaverde is a coffee system that takes bags of raw beans, packaged and delivered direct from plantations around the world, roasts them, grinds them and puts them through a drip coffee maker. 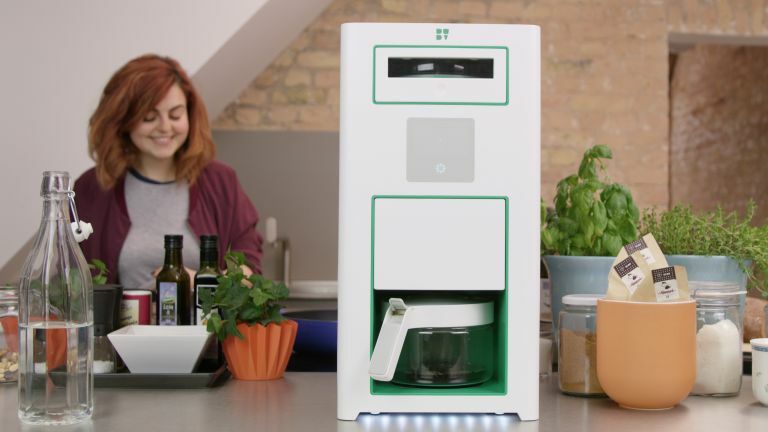 Welcome to the world's first farm-to-cup coffee machine. Having started life, inevitably, as a Kickstarter pitch back in 2015, Bonaverde is now finally hitting retail shelves. Or, at least, is available to buy direct from its manufacturer. It's one of the most thought-through products I have ever come across. Bonaverde wants not only to make a bean-to-cup coffee machine, but to control the entire supply chain. It provides farmers with web-connected packaging machines that bag and RFID tag beans. These beans are bought by you. You then scan the tag on the bag using an RFID reader on the Bonaverde machine and empty it into the roaster tray. At this point you are billed, and the farmer is paid. The beans are roasted using a 'roasting profile' (duration and temperature in essence although it's actually more complicated than that) determined by Bonaverde's experts and tailored to every batch of beans individually. The roaster uses an infrared burner to roast the beans in about 15 minutes. You use the bag the beans came in as a filter in the drip machine at the bottom of the Bonaverde machine. Once roasted, the beans drop into a grinder, and then into your filter, where 1 litre of drip coffee is made in the usual way. It may not surprise you to learn that this product hails from Germany. It's the brainchild of Hans Stier, who's one of those city boys who makes his money then quits to do something more interesting instead. The coffee the Bonaverde makes is undeniably very nice - I've tried it. The process involved is something like genius, and the seemingly very genuine attention to ensuring farmers in the developing world aren't exploited is heart-warming. The machine, although rather functional looking, is also incredibly impressive as a bit of tech. Its mix of sensors, carefully calibrated heating elements, web connectivity, filtering during the roasting process to eliminate smoke and reduce odour... It's little short of remarkable. In my opinion, they have totally over-thought this, however. I question how many people really want to roast their own beans. The smell it makes during the process is closer to what you get when you put cardboard in an oven to the familiar coffee bean smell that you eventually end up with, and as good as the air filter is on this, it can't entirely remove that. You'll also need to replace the filter every month, with daily use. The white/beige version of the machine is also borderline ugly, although the more expensive silver one isn't too bad. Finally, the 'walled-garden' approach Bonaverde has taken is surely likely to put many potential buyers off. All that said, you have to salute the obsessive effort that's been put into making this machine and its supporting eco-system. I really hope it gains enough traction to make Stier and his farmers very rich men, although I suspect respectable, cult-level success is the only realistic goal. The next move will be an espresso machine, which should be officially announced this year with a launch at some later point to be determined. This strikes me as a more viable product in the European market, but brings a raft of new problems as espresso-making is far more technically demanding than drip coffee. All that aside, for real coffee lovers, this is the most intriguing, exciting machine ever built. The Bonaverde machine is $799 in white and $999 in silver. Order will ship 'this autumn'. Coffee pouches are likely to be about $5 each and make 1 litre of coffee.